There are many challenges for payment processors in the 21st Century. One of the more obvious challenges is the sheer size of the fintech industry and the number of competitors which exist in the payments sector. Advancements in technology and the financial industry have made the fusion of the two a very attractive opportunity for budding technology minded entrepreneurs. With so many individuals and firms seeing this opportunity it of course means that competition is high in the payments sector and the fintech industry as a whole. 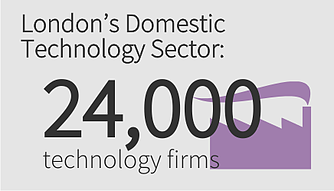 London’s domestic technology sector alone is home to 24,000 technology firms; a larger portion of technology firms branch into the fintech industry every year. Growing investment and growing demand produce many challenges for payment processors. All firms in this sector, incumbents and newcomers, must begin to scrutinise the ways in which they differentiate themselves from competitors and how they communicate with retailers and consumers. There is a growing demand for all fintech firms to provide outstanding technology, outstanding customer service and affordable prices. Our infographic below shows some interesting statistics on the current growth of the fintech industry with some focus on the surging growth in London and the payments sector.